Mukesh Sharma: The Lepcha Para teacher who had been denied Joining the work after getting Appointment letter in the hand on 1st April today started indefinite dharna in front of SI office. The process of appointment of Lepcha Para Teacher in Different Lepcha School was completed by District administration on the month of March after which a total of 46 lepcha Para teacher were handed over the appointment letter. When these teacher with appointment letter went to join the School in different area the school show a letter from District School board saying the matter of appointment is prejudice in High Court. GTA had filled the case alleging that the matter of appointment has been a straight interference in their jurisdiction by the state. Lendup Lepcha one of the teacher said after getting Appointment letter in the hand we still are unemployed . The para teacher who first twice appealed all to soon solve the matter today finally came in the raod and started its Dharna with different banner in tier hands . Meanwhile Pemba Lepcha from Kashyong area said it not the matter of 46 teacher but 46 families too. 46 unemployed were getting employed but the situation has made us feel we are again unemployed. Where to go for Justice he added. Meanwhile the teacher has made clear to intensify the agitation in days to come. 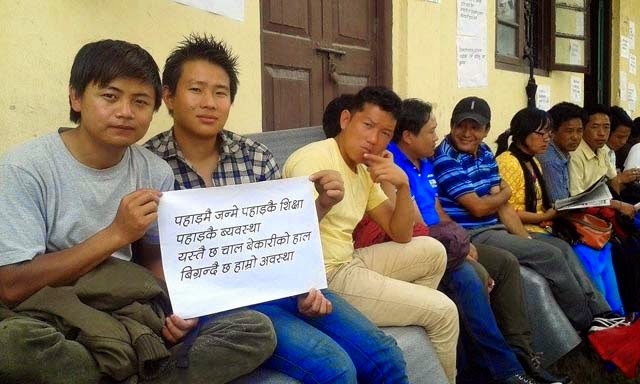 Lepcha Para teacher who had been denied Joining the work after getting Appointment letter in the hand on 1st April today started indefinite dharna in front of SI office.